Ask fellow campers about "Big Foot Beach State Park" and nearby attractions. 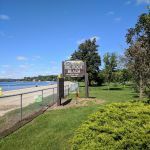 This campground is fairly quiet, located near Lake Geneva, making it a great place to stay if you plan on checking out the local shops and restaurants. The "beach" part of the park is a good distance from the camp sites, about 1 1/2 miles. The beach is also very small, and about 10 people can make it feel very crowded. The campsites themselves are nice, but in need of a little TLC. Our fire pit looked like it had seen its best days about 20 years ago and I am not sure I would want to actually cook anything on the grate. Other than that the trees were cleared back from the spots and most of the sites weren't too bad for leveling. There are some sites where leveling could be a challenge. We didn't have any trouble in our 24' motorhome, but larger trailers and motorhomes might have some trouble getting into a few of the sites as the roads are narrow and some of the sites are also fairly narrow. Only about half of the sites have electrical hook ups.The only water I saw was at the bathrooms or near the camp host sites. The center of the campground has a nice shower house that is clean and well kept. The water is on a timer so you have to keep pressing the button, but it is free to use, so no big deal there. 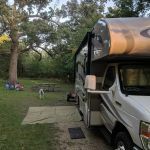 We camped at Big Foot Beach State Park in a Motorhome. Definitely take a drive or bike ride into Lake Geneva. Boat tours of the lake, boat rentals, shops, and dining are available to put together a nice weekend of activities. There is a larger beach in the town as well. During the Fall, go to Harvest Time Orchard in Twin Lakes, WI (about 10 miles away) for great cider and fresh made donuts. 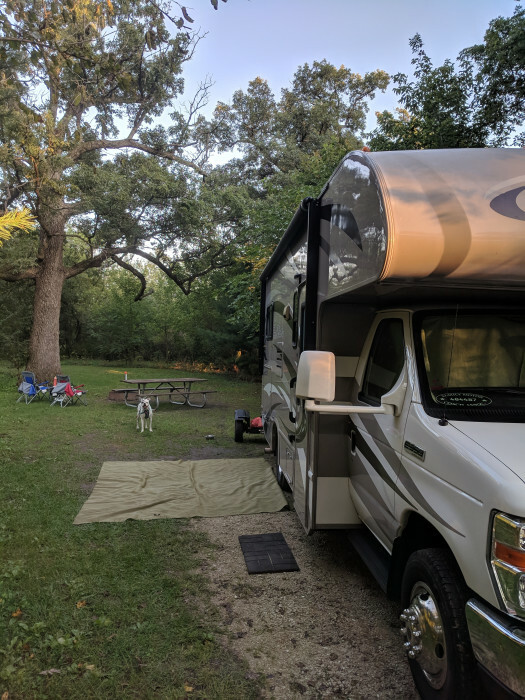 Staying in a Wisconsin state park is like ordering from an a-la-carte menu: there are so many choices and add-owns that registration takes concentration. The park has 100 sites, but only 15 or 20 have electric service. Water is available at the dump station but nowhere else in the park. Sites were often shallow and consisted of piled gravel for a pad. Our site was damp once we stepped off the gravel pad. The road through the park is very narrow and the trees are close; we do not think the park is suitable for large rigs. This is an urban park, surrounded by residential areas plus the local high school. 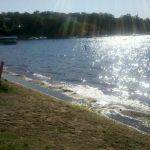 We were disappointed by the excessive charges imposed on non-residents ($10 daily access fee, $2 extra charge for the site, $5 extra for electricity--$29 total for each night), but the location is very good for visiting Lake Geneva. During our stay there were hardly any other campers staying in the park, even over the weekend. When in the area again, we will probably grit our teeth and stay again. 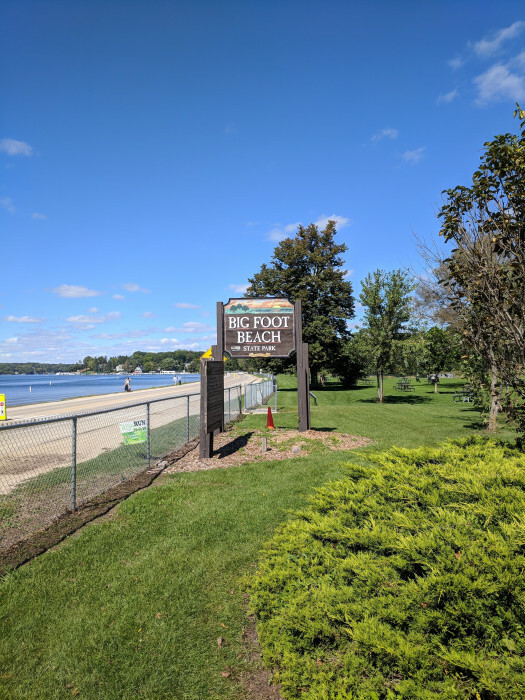 We camped at Big Foot Beach State Park in a Motorhome. A few electrical sites. It could be a nice park but it needs a lot of work. Mow the weeds would be a good start We camped at Big Foot Beach State Park in a Fifth Wheel. 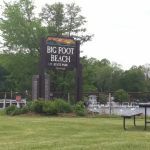 Are you affiliated with Big Foot Beach State Park ?